High school athletic programs and its leaders play an important role in the culture of its community. They have an incredible opportunity to not only lead young men and women on the field of play, but off it, in their community as well. Some coaches and athletic directors would even consider themselves as the public relations director between their program and the community. A school’s image and not only that of the athletic program may largely be dependent upon the effort or lack thereof from the guidance of coaches and athletic directors. The best part of promoting positive, non-game related aspects of a program and gaining public recognition is that it allows others to acknowledge that a program is an education-based athletic experience and not just winning games. Over the past 5 years I’ve been fortunate enough to work a long side programs that have been thoughtful, forward thinking and empathetic in their community. Today’s athletic directors, coaches and athletes are doing a variety of things to establish a meaningful relationship with members of the community. I was recently at the National Athletic Director Convention in San Antonio and a popular topic of conversation when discussing programs successes and duties was some of their community involvement. I was blown away by the charitable contributions and thoughtful communication, athletic programs are teaching their student athletes to have with the community. After the outpouring of examples expressed, I knew I needed to share some of these traditions and ideas. Have a strong connection with local newspaper beat writers, radio stations and television stations. They may not be able to attend every event, but you are still providing them with positive examples of young people in the community achieving success on and off the field. Provide the local media with article ideas to feature athletes who exhibited exceptional sportsmanship and served as a leader for other teammates. Share stories about athletes who have overcome life hurdles and injuries in order to play the sport or to make the team. These are human interest stories that are sometimes very relatable. Many schools are ramping up their involvement with their local youngsters. 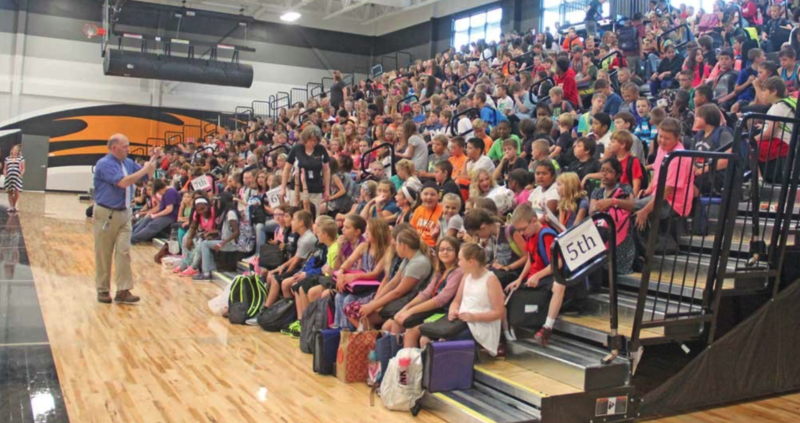 Some athletic departments are even implementing a student-athlete leadership council that act as athletic ambassadors to visit classrooms in their district. They visit local schools and teach life skills to students through activities they plan, and ultimately foster important relationships with the youth in the community. Social media is a platform in which your school and individual sports programs can create awareness. You can post results, highlights, promote upcoming events and share athlete and program successes. You can also let people know when you are raising money for charitable events. Covenant Christian High School in Indiana has an event called “Warriors Helping Warriors” in which they try and find a “warrior” in the community. This person may have been a veteran, a family member of an officer who passed or a student who battled disease. They raise money to help them for whatever they need at that time. This year the event helped raise money for the girls volleyball managers brother who was diagnosed with leukemia. All of the proceeds go to the family! A digital newsletter can be extremely useful to communicate with parents, members of the community and booster club members. This is a great platform to highlight an athlete of the month, important upcoming events and game schedules. Have some of your former athletes gone on to achieve successful athletic, collegiate or personal accomplishments? Keep your community updated on these! Many high schools are hosting middle and elementary school athletes to 1 or 2 day sports camps. These enrichment camps and clinics have a focus on age-appropriate activities and skills. In many cases, middle and high-school students have the opportunity to act as mentors to the younger students. What better way to set the tone and expectations of the season for parents than a preseason parents meeting? This meeting is a great opportunity to not only present necessary information about the program, but to do it in a positive and enthusiastic manner. Set the tone for the season, establish expectations and develop a good working-relationship with parents from day 1. Email notifications can help create a transparent line of communication between parents and other members of the community involving important updates such as game cancellations. This will certainly cut down on phone calls asking if a game is still being played or not. Your website is an extension of your brand as a program. This is a platform to post stories and videos that local news stations and reporters have spent time on that involve positive events involving both the school and the athletic department. It is also a place to list the current coaching staff and rosters. What are some things you are doing to get establish a relationship with the community?